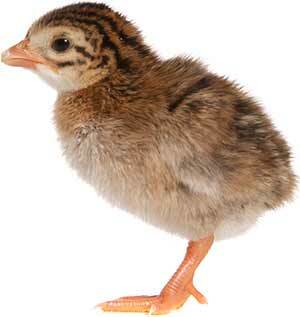 Young Guinea Fowl or ‘Keets’ to give them their correct name should be kept warm until they are fully feathered. If you have hatched your keets under a broody hen, she will keep them warm and there are a number of advantages of hatching guinea’s eggs under a broody hen: she will usually teach them to lay in nest boxes and to roost in their house. It’s generally accepted that Guinea fowl generally make lousy parents. Most people wanting to hatch a number of keets usually resort to an incubator and this guide to raising Guinea fowl keets hopes to give you enough information to get started. Day old keets have to be kept under a heat lamp (or in a heated brooder) at 35 deg C (95 deg F). Raise the heat lamp gradually by a small amount every week to decrease the temperature by 3 deg C (5 deg F) per week. After 6 to 7 weeks, the keets should be fully feathered and you will be able to turn off the heat lamp. For the last week of heat, turn it off during the daytime only so they still have some gentle heat at night if it gets cold. Handle your keets regularly from day old onwards. This is very important because when these guineas are older, they will be almost wild / skittish and you won’t be able to get near them unless they have got used to you handling them and being near to them. Keets should ideally be fed turkey starter crumbs, following on with turkey growers pellets. Turkey feeds are available in the UK from Allen and Page (Small Holder Range). Turkey feeds are slightly higher in protein levels to chick crumbs / growers pellets so are better suited to keets. Once fully feathered and off heat, they can usually be put outside in their final house if the weather is fairly mild. It is important to give them a chance to settle in their new house and give them 6 weeks to get used to sleeping in there before letting them out to roam. This seems like a long time I know but this is the only way you will ensure they will come back to their house at night. If they are being allowed into a covered run and cannot escape, this can be a shorter time but ensure in total they have 6 weeks enclosed before they can truly free range. I have in the past shortened this length of time to a few weeks by moving them in at 2 weeks old with their heat lamp to their final accommodation before they were off heat / fully feathered but do ensure there are no draughts and they still have the right temperature at night. You can cut sturdy cardboard boxes open to form shields around them to stop draughts at night if necessary. Once they are free range, you will notice their feed consumption drops. This is because guinea fowl will eat many bugs and grubs around the field / hedgerow. They will need more feed again during the colder months when there aren’t so many bugs around. 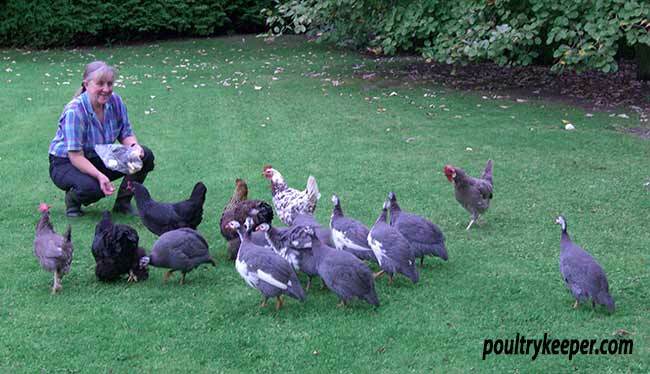 Adult guinea fowl can be fed layers pellets the same as your chickens with the odd corn treats to tame them. 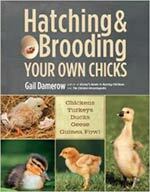 Hatching & Brooding Your Own Chicks by Gail Damerow. For further reading on Hatching and Rearing Chickens, Turkeys, Ducks, Geese and Guinea Fowl, that I highly recommend is Gail Damerow’s Hatching and Brooding Your Own Chicks. Gail covers absolutely everything you’ll ever need to know about hatching and rearing in this indispensable reference that I wouldn’t be without on my book shelf.